EA7 controlled all the game, the margin grew uo to 13 points in the third but commits the mistake of not closing out Roma so during the closing minutes it struggles a little bit. Olimpia stayed a step above but didn’t finish the game easily like it could have and probably deserved. Monumental game by Ioannis Bourousis, who scored 26 points, including the last 4 four free throws signing the game off. FIRST HALF – Ioannis Bourousis starts imposing his presence in the middle, he scores six points in the first three minutes and brings Olimpia up 10-6. Keith Langford is in attacking mode, a lucky bounce gives him a three. Milano is controlling the game early but Roma is staying close because of Gani Lawal energy inside. The second unit does a good job: Gentile completes a three-point play, Melli scores inside, Hendrix grabs an offensive rebound and at the end of first it’s 25-18. EA7 had a 64% shooting percentage from the field. The beginning of the second period is troublesone since Melli commits his third foul and has to take a seat. Gigi Datome is in a great rhytm. But a three-point play by Malik Hairston and a corner three by Omar Cook after a drive and kick by Bourousis are pushing EA7 up by 11, 45-34. At the time, Langfod has already scored 14. The first half is closed by a long two by Phil Goss, keeping Roma down by 8: 47-39. SECOND HALF – Bourousis is taking central stage, he scores nine points in five minutes keeping EA7 up in spite of Goss and Datome shooting extremely well. The greek center is making is presence felt under the boards, creates room for Langford on the perimeter, plays a complete game, reaches 20 points in the third. At the beginning of the fourth, Olimpia is up 73-60, Scariolo keeps Malik Hairston on the court along the second unit. Roma is getting closer, it’s within six with five minutes left after a letdown generating too many turnovers. 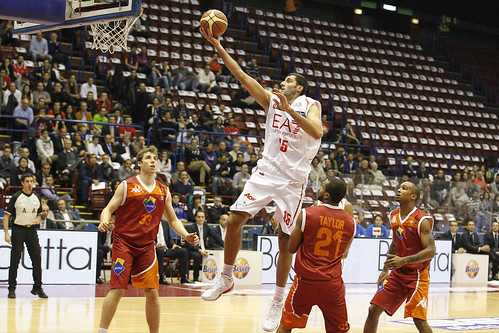 Datome from the line brings Roma down by three while Olimpias has scored just six points in six minutes. Bourousis’ return provides a lay-up, then he makes a steal igniting the fastbreak closed by a Hairston big dunk. 83-76 Olimpia with three minutes to go. Roma responds again, a big jump by Datome and it’s again a three-point game. Datome has a turnover, Langford goes inside but misses, Goss misses a three, Bourousis grabs a rebound with energy, draws a foul and makes two. It’s 85-80 and effectively the win for EA7.